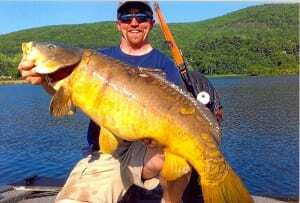 Anglers have been entering impressive catches in Vermont’s record fish program every year since records were first kept by the Fish & Wildlife Department in 1969, and 2013 was no exception. Three of the largest fish entered last year also qualified as new all-time state records. The Vermont Fish & Wildlife Department maintains the record fish program to help monitor productivity of fisheries throughout the state and also to give anglers recognition for their exceptional catches. Records are kept for 31 different species as small as a 12 oz. rainbow smelt and as large as a 38 lb. 3 oz. muskellunge and 42 lb. 8 oz. carp. • Fallfish – 3 lbs. 1 oz. – caught in Otter Creek by Robert Scarborough of Brandon. • Freshwater Drum – 21 lbs 11 oz. – caught in Otter Creek by Aaron Schondube of Vergennes. • Carp – 42 lbs. 8 ozs. – taken while bow fishing in the Connecticut River by Jeremy Ballantine, West Dover, VT. The last few years overall have been remarkable in terms of record fish catches in Vermont. Fisheries biologist Shawn Good, who administers the record fish program, says a recent trend in record-breaking catches are a testament to the great quality and diversity of fishing opportunities that are available to anglers in Vermont. “We’ve had record breaking fish catches almost every year over the last 10 years or so. Almost half of the 33 record fish currently recognized have been set since 2001, with eight of them being caught since 2010,” said Good. You can learn more about Vermont’s big fish records on Vermont Fish & Wildlife’s website (www.vtfishandwildlife.com). A database of Vermont record fish entries is searchable by species, body of water and year of catch. While you are there, be sure to check out the Master Angler Program entries and photos.